The most frequently asked lawn question in Fredericton this year is "What's the deal with the lawns being torn up and what are all the grubs?" The grubs are either June bug grubs or European Chafer grubs. The two are pretty much identical (apparently and entomologist can look at their butts' and tell the difference) in appearance. The easiest way to find out is when they turn into the beetles - then they look much different (you can Google pictures). The biggest difference is the life cycle - June bugs are a yearly thing and the Chafer is a three year life cycle. The latest epidemic is PROBABLY the chafer beetle. Closer observation and monitoring will tell for sure but it's generally accepted to be Chafer at this point. The reason why this is happening is likely the whole climate change thing. The reality is that we don't have the harsh winters anymore that at one time controlled a lot of these bugs - so welcome to the new era of pests! Control and lawn repair is obviously the major concern at this time. There seems to be three or four possible methods of control. Each has limitations and none of them have yet proven to be 100% effective though some of the pesticides if used appropriately come close. There are a couple of pesticides that can control the grubs. They are effective when used on a regular basis. They must be applied by a licensed pesticide applicator/company. As many have found out, pesticides are tightly regulated in New Brunswick (not necessarily a bad thing but it limits pesticide usage at times when a critical outbreak of a single pest occurs) and only allow a limited amount of product to be used on your property. The regulation allows for application to 40% of the lawn area for ALL herbicides/pesticides in a given year. Fortunately the provincial government has allowed a variance for this specific pest. If you know anyone in levels of government from MLA's on down - THANK THEM! It is possible to apply for a permit that allows you to spray your whole property. This can be done as a curative and a preventative measure just by showing there are grubs in or around your property. There are 3 main chemicals commonly used and licensed in Canada for control of grubs. These are Merit, Acelepryn and Arena. Goggle any of those and read up on them if you are going to have them applied. Merit has proven to be harmful to bees and other pollinators so we strongly suggest not using that product. Acelepryn seems to have the best long term control, has low toxicity to non-targeted pests and is very effective against the grubs. Arena seems to be slightly behind Acelepryn for appropriate control - just as effective but not quite as long lasting. These are the common biological control for grubs. Basically they are microscopic worms that deposit a parasite in the grubs that eventually kills them. These worms come in a liquid solution that you then apply to the lawn. Scientifically they are proven to work. However, they are a living organism and need to be treated and used VERY CAREFULLY or the worms will die and they won't work. We have done a few tests over the past 3-4 years and the results have been inconclusive. In closed trials (grubs in a container) they are very effective. In the open environment it is questionable whether they are controlling grubs or if the natural feeders are eating the grubs. There have been some good long term studies done in B.C. and they are finding the nematodes to be on average 50% effective in controlling grubs. They have also found that animals provide about 50% effectiveness as well. - The temperature of the soil (SOIL temperature not the air temperature) must be appropriate for the type of nematode being used. The sustained soil temperature must be over 12 degrees Celsius for the coldest weather nematodes. May is NOT an appropriate time to use them in New Brunswick! - They have a limited shelf life and must be stored at the proper temperature (6 - 8 degrees Celsius). - After they have been added to water to apply they need to be applied in 10 to 20 minutes. - They will settle out in your spray tank and need to be shaken or agitated every 3 or 4 minutes. - They are living organisms that need to feed. If they don't make it to some food (the grubs) in 2 - 4 hours or so they will die. - To get to the grubs they need to be watered in to the depth of the grubs. The amount of water required will differ depending on soil type, depth of grubs, rate of water application. If you over water the nematodes can wash right down past the grubs (and die). - When you are applying the nematodes make sure you dig to see how far down they are and how far your watering has penetrated. 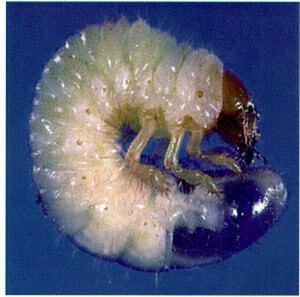 -	Older grubs are stronger and can survive the nematodes 'attack' more easily. Right after eggs have hatched (USUALLY around the end of June/early July) is the best time to get them. Early in the spring they are very active and treatable as well but they are tougher at this stage of life and the SOIL temperature likely isn't appropriate for nematodes. Nematodes can and do work but they need to be handled appropriately! Always dig and see what they're doing no matter what treatment you are using. You should see some dead and dying grubs within 3 to 5 days. To see if any treatment is working, bottle up some grubs and soil and treat them at the same time. That way you can watch to see if it's working. The highly visible damage to your lawn right now is mother nature taking care of some of the problem. The birds and animals are digging up your lawn and eating a pile of the grubs right now. If you test dig the areas that are torn up you will likely find very few grubs. Check the area around the dig zone and you'll likely find more grubs. This is unsightly, somewhat effective (we're observing to see how many the animals get) and takes a while for the 'Circle of Life' to take care of the problem. After the animals have cleaned out the grubs, rake the area up (it should be nice and loose with all the digging), rake in a bit of compost, lime and fertilizer and seed the areas. We have done physical removal of grubs with some success. We till down to the depth of the grubs (dig first to find out), pick as many as we can and crush them or drown them in a bucket for a couple of days. Then repair the lawn with seed or sod as desired. That seems to take care of most of them. Squish the grubs that you do find (yes they REALLY stink when you squish a bunch of them). Remember that the grubs won't be in the dug up areas - they have been removed by animals - so test dig all around to see where they are and how deep they are. As with most pests in the environment there will be a stabilizing point of nature and control versus the numbers out there. We are trying to keep on top of observing the patterns and methods of control so keep in touch for any new information. The biggest thing is to make sure that you or your lawn care professional is actually digging to observe the grubs and to make sure treatments are working. It may be that the animals have already removed them all so a treatment may look effective when it's not. If you do aim for the 'do-it-yourself' approach, keep track of what you find out. If you go for a lawn care company to work on the problem make sure they can answer a few questions from the information above.